Questions Send Us on Wondrous Quests! It all started with a routine activity – that of checking my email. As my eyes scanned the subject lines, the words “Our class has a word question” stood out. “Ooooooooo!” I said out loud as I opened it with delight. “Yes, yes, yes!” With a great big smile, I got up from my chair and did a bit of a happy dance! There is just so much to love about this request! The third graders are thinking about words! They thought of other words that also have an initial unvoiced <p>. They thought of yet other words with unvoiced letters. I immediately started typing up a response. Not because I had any intention of replying by email, but because I wanted to collect my thoughts and lay out what I understood on paper. 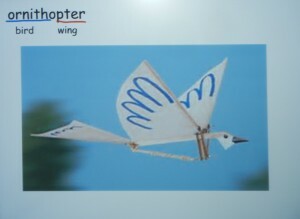 I wanted to reread the entries at Etymonline for <what>, <why>, <know>, <pterodactyl>, and <helicopter>. I wanted to reread my notes from Gina Cooke’s LEXinar on Old English. I wanted to reread the information listed on my <what> LEX InSight Word card. I wanted to reread the information on the <wh> card in my LEXeme Deck. I have learned so much in the last few years that I like to check my facts so that I don’t miss sharing any fascinating parts of each word’s story! Shortly after that, I went to find the third grade teacher to thank her for such a delightful email. Then I invited her students to my room so we could talk. Before they came, I shared all of this with my fifth graders. I wanted to share not only the information, but the curiosity and inquisitiveness of the third graders. 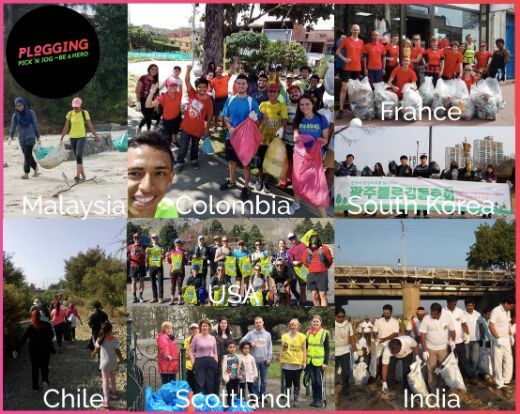 This was indeed something to be celebrated! We began by looking at <know>, <what> and <why> since they were all from Old English. I began by showing them the following video. The man speaks Old English and I wanted them to know what it sounded like. Since the sound isn’t the best on this video, I sometimes stopped, backed up and let them hear certain words twice. We talked a bit about the Old English words that they could understand. One of those was roof. I wrote the Old English spelling hrof on the board so they could see that the spelling might feel strange and unfamiliar, but the pronunciation of many Old English words is sometimes more familiar than we expect! I wrote on the board as we continued our talk. 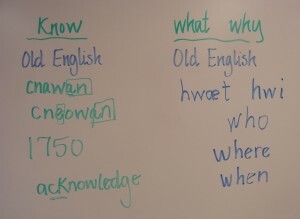 The Old English spelling of <know> was cnawan. The <c> and the <n> were both voiced in the pronunciation. The <an> indicated to the people who spoke Old English that this word was a verb. It’s denotation was to “perceive or understand as a fact or truth”. 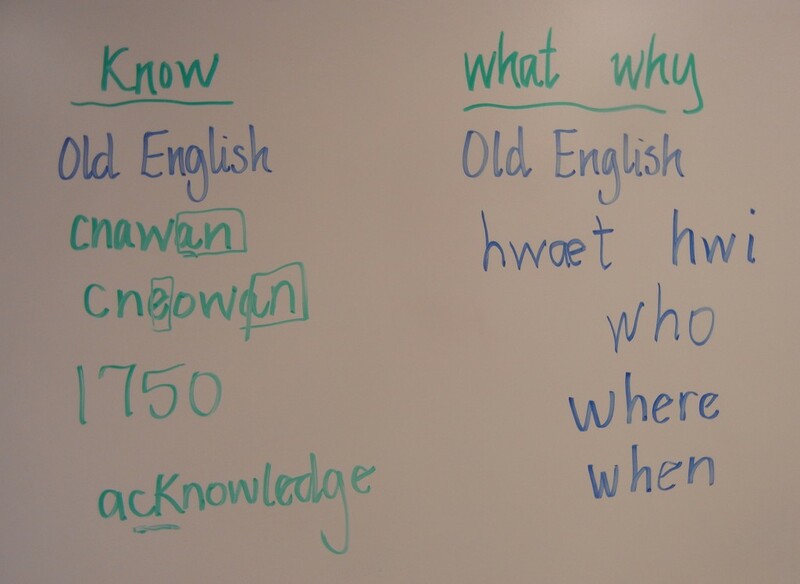 The past tense spelling of <know> (knew) was spelled cneowan. Again, if we cover up the final <an> which indicated to the speakers of Old English that this was a verb, we see cneow. The students noticed the <e> that is still in the present day spelling of <knew>. By Middle English, the <c> was replaced with a <k>, but that didn’t change the fact that the <k> and <n> were still voiced. It wasn’t until 1750 that the <k> was no longer voiced. What is interesting here is that sister languages to English (German, Dutch and some Scandinavian languages) still voice both of these letters. Ours is the only language in which voicing the <k> faded into nothing! I wrote the word <acknowledge> on the board to point out the <c>. 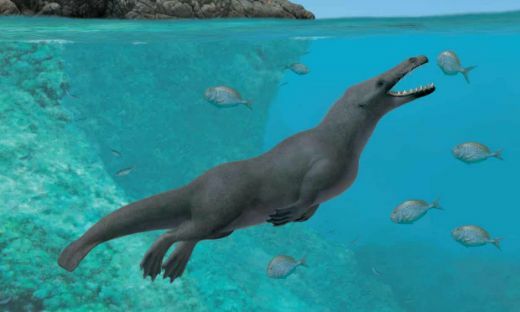 At Etymonline, Doug Harper calls it a parasitic <c>. He suggests that perhaps the <c> is there to preserve the historical <kn>, with each letter voiced as it was in Old and Middle English! 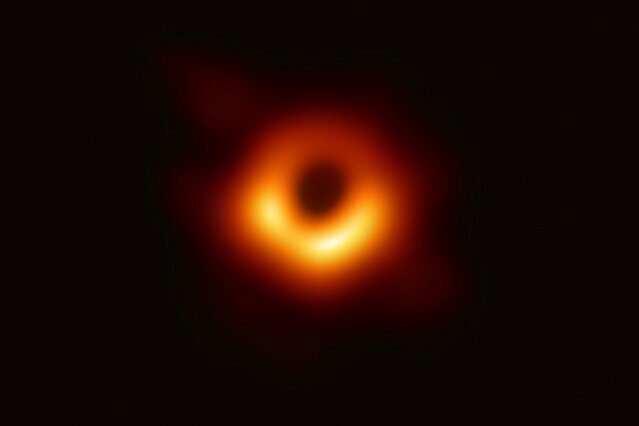 In my mind I imagine it latching on to the <k> as a parasite would, in order for there to be a <ck> consonant cluster which can only represent /k/, and thus restoring the voicing of the <k>! Such a noble story this word has! Next we looked at <what> and <why>. I wrote the Old English spellings for both: <hwæt> and <hwi>. After the 14th century, it was common to see the <hw> reversed to <wh>. If we look at the questioning words: what, why, when, where, which, whether, who, whom, and whose, we can imagine that all of these were once spelled with the <h> before the <w>, because they are all of Old English origin. As far as the pronunciation of the <wh>, the only three of those questioning words that do not begin with a /w/ are who, whom, and whose. The fact that these three words have an <o> following the <wh>, indicates that the initial pronunciation will be /h/. Now it was time to take a look at Ptarmigan, pterodactyl, and pteranodon. I put an asterisk next to Ptarmigan and told the students we would come back to it. Then I focused on three words that have an initial <pter>. 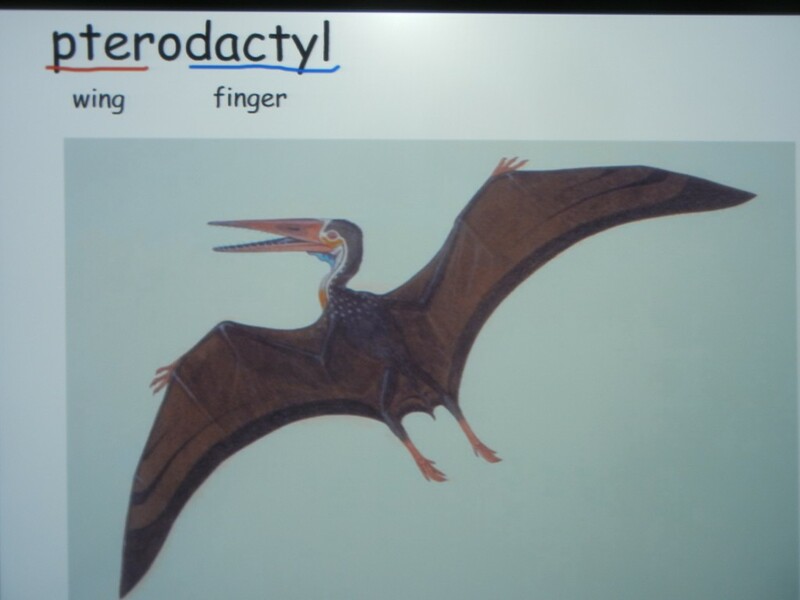 According to Etymonline, a pterodactyl is an extinct flying reptile. The word entered the English language in 1830. The first base in the word is from the Greek word pteron “wing”. The second base is from the Greek word dactylos “finger”. 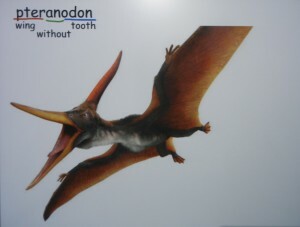 According to the Oxford American Dictionary, the pteranodon is a large tailless pterosaur (flying reptile) with a long toothless beak, a long bony crest, and a wingspan of 7 meters. The <pter> bound base denotes “wing”, the <an>privative prefix denotes “without”, and the second bound base <odon> denotes “teeth”. This last base took us to a brief look at words like orthodontist and dentist, tooth and teeth, foot and feet, and <pod> (tripod) and <ped> (pedicure). Interesting relationship between these words! According to the Oxford American Dictionary, a pteropod is a small mollusk with wing like extensions. It uses them for swimming. 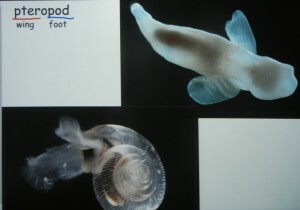 The first base is <pter> and denotes “wings”, and the second base is <pod> and denotes “foot”. It appears to have a body similar to that of a snail or slug. Then I went on to ask if anyone knew the word< speedometer>. They all did. I asked what a speedometer did. They knew that it told how fast a car was moving. I pointed out the <o> in that word. Was it part of the first base <speed>? No. Was it part of the second base <meter> denoting “measure”? No. In this word it is pretty obvious that the <o> is just connecting these two bases together. It is a connecting vowel. Again – what a brilliant observation! Now I told the students that I found some more words with <pter>, except that the <pter> was not the first base in the word. Another fabulous question! I told her that it is a suffix that is used with some scientific words. I wrote the word <pupa> and <pupae> on the board and explained that the first is singular and that the second is plural. I know this by the <a> and <ae> suffixes. But afterwards I started to wonder about what I had said. I had a nagging feeling that I was mixing up my Latin and Greek suffixes. My own question took me to the Oxford American Dictionary. I found out that <pupa> and <pupae> are clearly of Latin origin. 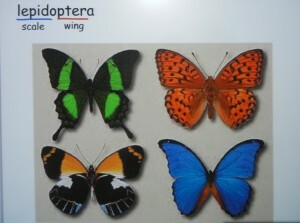 Lepidoptera was listed as having a Modern Latin (plural) origin, yet the bases and connecting vowel are clearly of Greek origin. 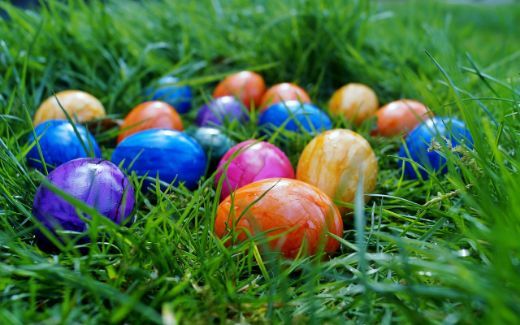 Etymonline explains that the <a> suffix is a “nominative neuter plural ending of certain nouns and adjectives in Latin and Greek that have been adopted into English”. Since I know Lepidoptera is a plural noun, this makes the most sense to me. 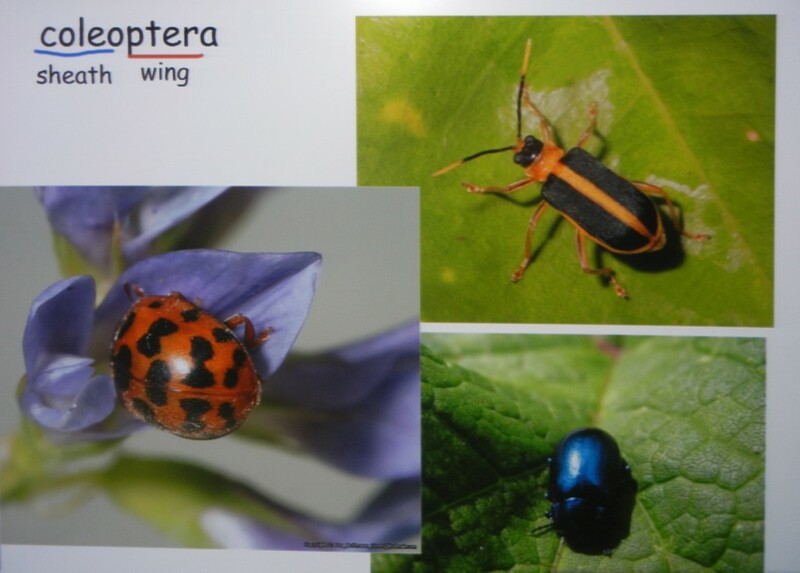 The Oxford American Dictionary describes coleoptera as an order of insects which includes the beetles. It is the largest order of animals on the earth! The wings on these beetles are close fitting and protective. The first base is from koleos (<cole>) “sheath” and the second base is from pteron (<pter>) “wing”. 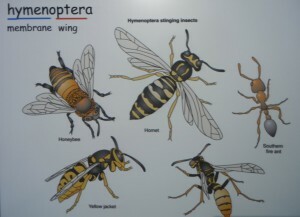 The Oxford American Dictionary describes hymenoptera is a “large order of insects that includes the bees, wasps, ants, and sawflies. These insects have four transparent wings and the females often have a sting”. The first base is Greek <hymen> “membrane” and the second base is <pter> “wing”. 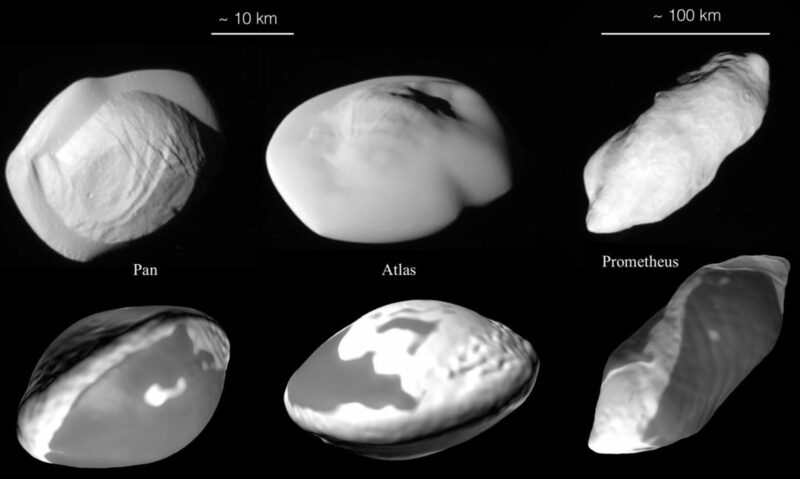 The first base is from Greek <ornith> “bird” and the second base is also from Greek <pter> “wing”. Because both bases are of Greek origin, the connecting vowel is an <o>. I underlined the Greek base <pter> in each of the words. Then I added <helicopter> to the list. I was right in guessing that all of the students knew that word and what it meant. Then I asked this question, “When the <pter> base is first in the word, you already noticed that the <p> is not voiced. What happens when the <pter> is final in the word? Is the <p> voiced or not? Everyone got busy pronouncing this list of words to find out. In the end it was decided that when the base <pter> is final in a word, the <p> is voiced. When the <pter> is initial in the word, the <p> is not voiced. So the important take-away is that the <pter> bound base (from Greek) has a denotation of “wing”. When we see this base initially in a word the <p> is not voiced, but when we see this base final in a word the <p> is voiced. 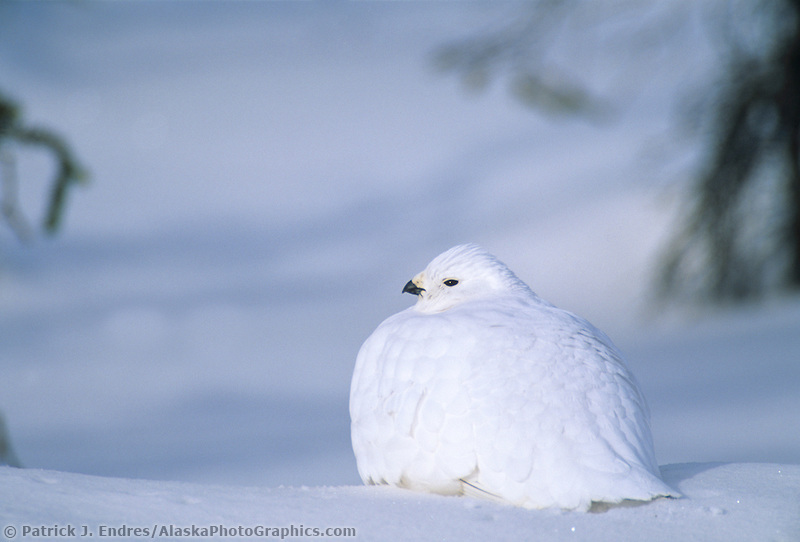 But what about the word <ptarmigan>? This is, after all, where this particular quest began! 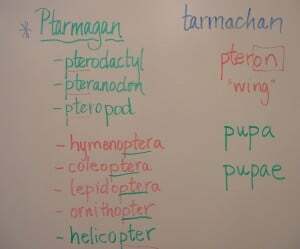 I asked the students to carefully look at our list of words with <pter> and to compare that spelling with what we see in <ptarmigan>. Right away someone noticed that there was an <a> in <ptarmigan> where there had been an <e> in words sharing the <pter> base. Excellent noticing! The Oxford American Dictionary describes the ptarmigan as “a northern grouse of mountainous and arctic regions with plumage that changes to white in winter. This word originated in the late 16th century from Scottish Gaelic tàrmachan. Etymonline adds that the <p> was added in 1680’s as a mistaken Greek construction (perhaps based on pteron “wing). Ptarmigan shares an idea of having wings and an initial <pt> spelling, but does not share a base or Greek heritage. 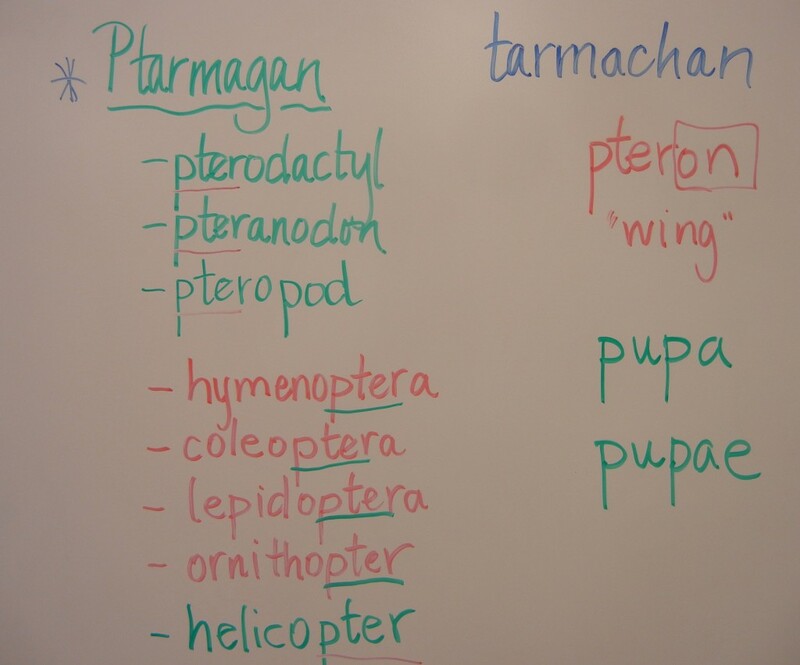 And now, because of these wonderful questions that sent us on these wonderful quests, we all (third graders, fifth graders, me and you) share an understanding of the <p> in <ptarmigan> … and so much more!